Selections from The Johannes Oentoro Library Policy Manual are listed below. RI Law No. 28 of 2014 regarding copyright should be observed as should all other governing regulations and policies. Notices to this effect are posted on library copy machines. Information sources, including internet content, should be properly cited and referenced in bibliographies. Plagiarism is a serious violation of the UPH Student Code of Academic Integrity. Full-time faculty and administrative officials may suggest new materials for the collection by filling out the material inquiry forms below. The Local Content Collection contains items published internally by UPH and STPPH, such as theses, dissertations, internship reports, final assignments, etc. The Local Content Collection is a room-use only collection. User must submit their smartcard in order to use the collection. Copying is prohibited. 1. Smartcards are required for transactions. 2. Cash transactions are prohibited in the Library except for in the Graduate School Library. Nobu e-money is the only form of payment accepted for fines and fees. The library is not liable for any cash transactions. All issues regarding unauthorized cash transactions will be the user's responsibility. 3. Loaned items may be renewed; however, renewals are not allowed on reserved or recalled items. 4. The library reserves the right to recall any loaned items. 5. Undergraduate and UPH College students must renew items in person; all other users may renew items by phone. 6. Undergraduate and UPH College students may not borrow Graduate School Library materials. 7. Fines will be charged for overdue items (see Table of Fees) except for full-time academic and non-academic staff. 8. Borrowers with overdue materials or with outstanding fines or fees are not allowed to borrow until all obligations are settled. 9. Users are fully responsible for any lost library materials. Replacement with the same item must be made. If the item is no longer available, replacement with a similar item is permitted only if approved by the head of the department. Computer Use: Computers in the library are to be used for educational purposes only. Misuse, including, but not limited to, accessing inappropriate or pornographic internet sites, viewing or sending offensive images or files, playing computer games, damaging/destroying/removing any piece of computer hardware or software, is a violation of the UPH Code of Conduct and subject to disciplinary action (see Penalties section). Information Literacy Training Program: Any student may request an Information Literacy Training class (a minimum of 5 students in each class is required) by filling out the online form on the library's website which includes indicating preferred times. To make an online request, a UPH User ID (NIM/NIK) and patron number are required. Please contact 021-5460901 ext. 1382 or 1370 for more information. Belongings: Library users are responsible for their belongings. Do not leave items such as wallets, purses, mobile phones, car keys or laptops unattended. The Library is not responsible for any lost or stolen items. Food and Beverages: Do not bring food into the library. Only mineral water in bottles or cups is allowed. Furniture: Do not rearrange or remove any furniture. Mobile Phone: Users should set their mobile phones to silent mode or turn them off while in the Library as the Library is a quiet environment. Photography & Filming: Ask permission from the librarian before taking pictures or videos. Security Alarms: Do not take books, journals, or other items outside the library unless they have been handled by the circulation staff. If the security gate sounds an alarm as you exit, you must return to the Circulation Desk to verify that the items were handled properly by our staff. Shelving: Do not re-shelf books or journals yourself. Sleep: Do not sleep in the library. Theft, Defacement, Mutilation, Misuse or Destruction: The theft, defacement, mutilation, misuse or destruction of library property is prohibited. Being caught doing any of these activities will result in a penalty (see the Penalties section of the Manual). Sandals & Dress Code: Sandals are not allowed in the library and dress should be modest and proper. Bags, Packages, etc. : Bags, packages, and backpacks may be taken into the library or deposited in a locker before entering the library. The library staff has the right to check them. Goods: Do not leave valuable goods inside the lockers. The library will not responsible for the loss or damage of any items kept in the lockers. Smartcards: Smartcards are required for entering the library. Visitors without a smartcard have to contact the library staff prior to visiting. There are a number of seminar rooms, multimedia viewing rooms, and study rooms available on the 2nd and 4th floors of the Central Library. 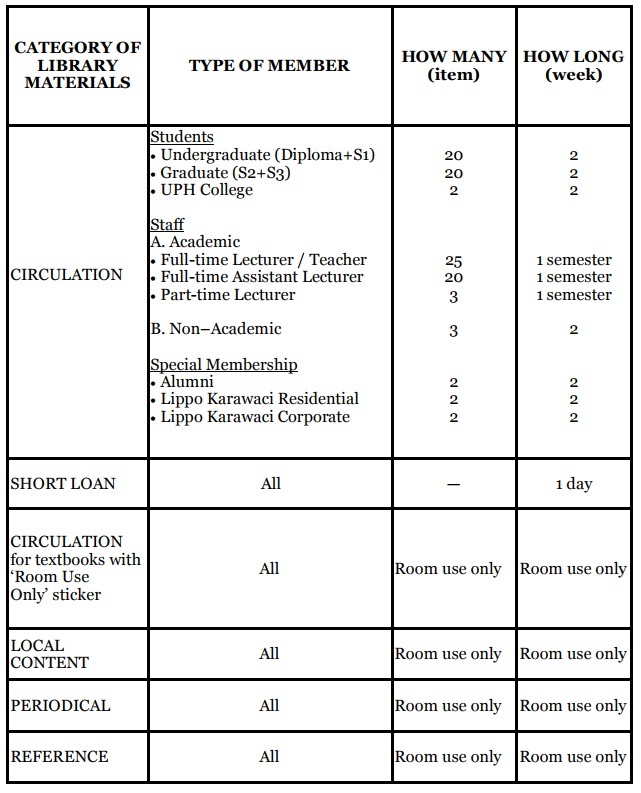 Rooms are for UPH academic activities; commercial uses are not allowed. Any non-UPH person requires prior permission from library staff and bookings must be made at least a week in advance. Library furniture (such as sofas, chairs, paintings, pillows, etc.) may not be removed without permission. Room noise levels should conform to the quiet environment of the rest of the library. Contact library staff in advance with any special requests. Non-UPH parties (crews, photographers, etc.) must follow all library rules, including the dress code (no sandals). Library LCD projectors and laptops can be used during operational hours, except Saturdays, and must be prepared by the library staff. Users can make online reservations for some rooms (Group Study Room 4.1, Multimedia Viewing Room 2 , Seminar Room) via the library website. ID and patron number are required. Please contact 021-5460901 ext. 1382 for further assistance.